Martha Stewart may take a lot of flack, but I have to say I find a lot of helpful hints and creative ideas on her website. While I won’t claim to be her biggest fan, I’m also not a hater. I admire her creativity. Recently, I found a couple of handy kitchen printables on her website. The first is the template for Cook’s Helpers, a set of 3 printable kitchen conversion guides. 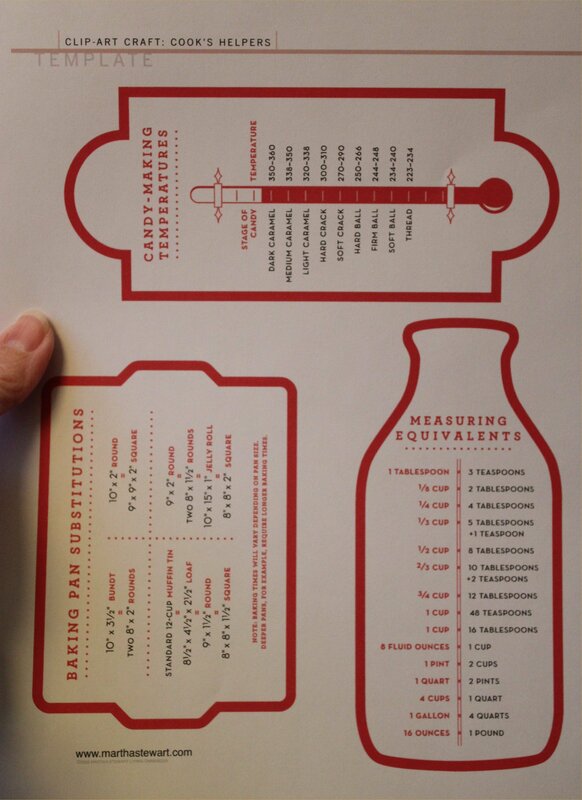 I especially find myself using the cute Measuring Equivalents chart. So much so, I printed the template page and pasted them to the inside of my kitchen cabinet so I can reference them while I’m cooking. There’s also a baking pan substitution chart to help you convert a 13×9 baking pan into rounds (or vice versa), and a handy candy making temperatures chart to help prevent high-heat disasters. You can post the entire page, or cut them out and place them in different areas of the kitchen. You can also cut them out, laminate them, hole punch the tops and attach them to a set of colorful measuring spoons/cups to add to a kitchen gift basket for a housewarming gift. I also love these Clip-Art Freezer Labels. 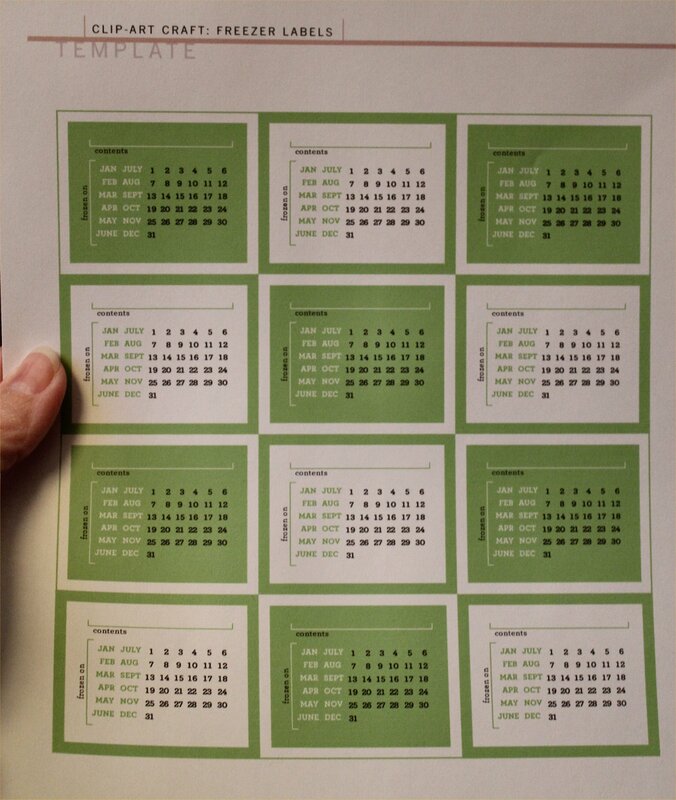 Print them on full-page label paper, cut them apart, then fill in the contents line, circle the correct date information and stick them on bags or containers. How handy is that? This is one of those “Why didn’t I think of that?” moments for me. It’s practical, clever and handy. I wish my mind worked like that. Say what you will, but Martha is a wealth of information and I like that. Of course, I like anything that makes my life easier! I’m going to print these out. Then, this weekend, I’m going to go to the thrift store and get magnetic paper and stick the conversion charts on it and plop them on my fridge! Joy! Hey, that’s a great idea! You could print the conversion charts on the full-sheet labels and stick those to magnetic paper so you could stick them to your fridge. Why didn’t I think of that? Hip-hip-hooray for team brain-storming! Helpful tip – magnets do not stick to the front of my new stainless refrigerator, so test the front of your fridge with a magnet before you buy the supplies. Thanks, KJ! Thanks, Brandie! And thanks for dropping in and commenting. I appreciate it! My fridge is covered with magnets…however, I am getting a new SS fridge in the next year, so…inside the cabinets they will go! Then, I’ll have to figure out what to do with the gazillion magnets stuck on my fridge! I love my magnets. I didn’t know they won’t stick to SS fridges. Waaaa! Thanks, again, for the tips! Joy! The entire side of my old fridge was covered in magnets. Sadly, they all went into a bag once the new fridge was delivered. I miss my magnets, but I love my stainless steel French door refrigerator more. You could always buy an old, ornate frame at the thrift store, have a piece of sheet metal cut to fit, and make a magnetic bulletin board to put your magnets on. You could paint it to match a home office, your kitchen for grocery lists and notes, near the phone for messages, or put a few hooks at the bottom and hang it near your back door for messages and you could hang your car keys on it. You could even paint the metal with chalkboard paint before you frame it – then you’ll have a chalkboard for grocery lists, menus, and more AND it would still be magnetic to hold your collection. Use the camera on your cell phone to snap a photo of your shopping list, and go! Oooo I love the freezer label idea! I have been looking for something to use in my freezer, as it is currently The Freezer of Doom. She’s too much of a perfectionist for me. When I see her working with someone else on TV, I’m always afraid she’s going to break out a ruler and smack them on the hand for getting glitter outside the line. She intimidates me. I’m much more laid back in my approach to food and crafts. Don’t get me wrong….I want it to be perfect, too, but I’m much more inclined to laugh at my screw ups and try again. My motto – if you can’t have fun, why bother? Life is too short to be high strung. Conversion Charts are a Life Saver! I have magnetic ones on the side of my fridge & I use them all the dang time. Now the freezer labels–that’s just downright brilliant! I SO need that. Much cuter and efficient than the freezer tape & sharpie method currently employed in my kitchen. I love the freezer labels, too. So simple, so handy, so cute! I’m using the conversion charts a lot, but I still wish there was one more – a substitutions chart. Things like “if you’re out of buttermilk, use one cup of milk and 1 tablespoon of vinegar” or “if you don’t have cake flour, add cornstarch to all-purpose flour”. I would find that extremely handy, as well. I may have to do some research and create my own. You totally should! Then put it on a magnet, and sell it to the masses! There was a time when I reluctantly admired her creativity, but after having seen a couple of shows and noticing that she is really not that good at much anything, and finding out that some of my crafty internet friends provide her with the creative part, I have come to a conclusion that what she IS good at is marketing, selling, presenting. It’s not HER creativity you admire, it’s her staff’s creativity. I haven’t thought of Martha Stewart as anything more than the face of a brand in a very long time. Most, if not all, of her content comes from a hoard of creative contributors. For that reason, I view her website and other media outlets as a resource for ideas, not a reflection of what Martha herself is capable of. It’s just a shame she doesn’t give credit where credit is due – to her staff & contributors.